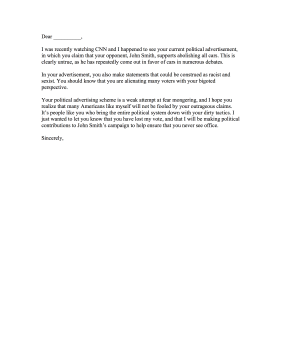 Great for keeping political debate clean and fair, this complaint letter warns a candidate that misleading advertisement will not be tolerated. I was recently watching CNN and I happened to see your current political advertisement, in which you claim that your opponent, John Smith, supports abolishing all cars. This is clearly untrue, as he has repeatedly come out in favor of cars in numerous debates. In your advertisement, you also make statements that could be construed as racist and sexist. You should know that you are alienating many voters with your bigoted perspective. Your political advertising scheme is a weak attempt at fear mongering, and I hope you realize that many Americans like myself will not be fooled by your outrageous claims. It's people like you who bring the entire political system down with your dirty tactics. I just wanted to let you know that you have lost my vote, and that I will be making political contributions to John Smith's campaign to help ensure that you never see office.